The Deadly Vibe Group has won a prestigious national Indigenous health award in the category of Environmental health initiatives – Improving living conditions and quality of life. 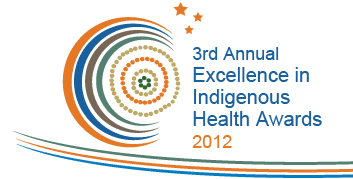 Vibe accepted the award at a gala dinner at the 3rd Annual Excellence in Indigenous Health Awards 2012, held in Sydney on Wednesday night. The awards are given in recognition of the inspirational work from service providers, communities and individuals making a difference to ‘Close the Gap’. They celebrate innovation, success, resilience in Indigenous service delivery. The environmental health award is about creating and maintaining environments which promote good public health. Vibe entered the Vibe Project in the category, consisting of the Vibe Alive Festivals, the National Indigenous 3on3 Basketball and Hip Hop Challenge – the Vibe 3on3®, the Deadly Awards, Deadly Vibe magazine, InVibe magazine, Deadly Sounds Radio program and Deadly TV which produced Living Strong and Move It Mob Style. Vibe congratulated other nominees in the category, who were working tirelessly to improve the health of our First Australians. “Our insight has always been to engage our young people through what unites us, namely music, sport and culture. Once engaged, we deliver the important information on health and lifestyle issues such as drug and alcohol, chronic disease, domestic violence and mental health,” Gavin says.